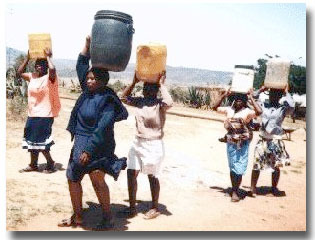 Millions of people worldwide are forced to walk long distances on a daily basis to collect their water requirements for the day. Traditional methods of collecting water include the use of 20-liter (5-gallon) buckets, which are laboriously carried on the head.Ê Extensive suffering occurs in the process. This method is very time and energy consuming and is also the cause of many serious health problems. The Hippo Water Roller was specifically designed to alleviate the suffering caused by a lack of access to water. 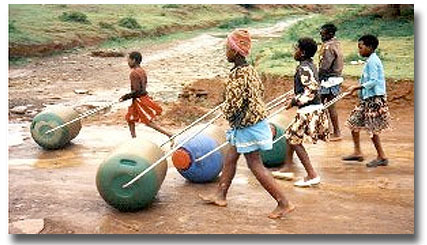 The Hippo Water Roller is a barrel-shaped container designed to transport 90 liters (20 gallons) of water. It comprises a drum with a large screw-on cap and a clip-on steel handle. The drum is manufactured from UV stabilized Polyethylene and has been designed to withstand typical rural conditions such as uneven footpaths, rocks and even broken bottles. The large opening (135 mm / 5.3 inch diameter) allows for easy filling and cleaning of the interior. The sealed lid ensures hygienic storage of water and the steel handle provides firm control over difficult terrain while pushing or pulling the roller. The innovative design allows water to be placed inside the “wheel” rather than carried above the wheel. The 90kg (200 pound) weight of water is borne on the ground resulting in an effective weight of just 10kg (22 pounds) on level ground. Children and the elderly can easily manage a full roller over most types of terrain. Extensive field tests over many years and various awards have proven the effectiveness of the Hippo Water Roller. Approximately five times the normal amount of water can now be collected in less time with far less effort. A product that is “compostable” is one that can be placed into a composition of decaying biodegradable materials, and eventually turn into a nutrient-rich material. It is almost synonymous with “biodegradable,” except it is limited to solid materials and does not refer to liquids. Composting occurs in nature every day as fallen leaves and tree limbs biodegrade into the forest floor. The EPA considers composting a form of recycling because it turns resources into a usable product. CANADIANS DISPOSE OF THE EQUIVALENT OF SIX FOOTBALL FIELDS PILED ONE KILOMETRE HIGH WITH GARBAGE! COMPOSTING CAN BE PART OF THE SOLUTION. Where can I get information on composting? A great place to get information on composting is through the internet. Begin with a search on “Industrial composting or municipal composting prorams”. +1Water is based in Montreal, Quebec, Canada. Windrows: Organic materials are placed in long triangular rows called windrows. Windrows are turned and watered occasionally to ensure that the micro-organisms get an adequate supply of oxygen and that any clumps of organic material are broken up. This method is commonly used for composting leaf and yard waste, commercial food wastes, or such “specialty items” as shredded Christmas trees. Static Aerated Pile: Organic waste materials are formed into windrows over perforated pipes. Rather than the windrows being turned, air is supplied to the micro-organisms through the pipes. Almost all municipalities own the necessary equipment required for centralized composting operations using windrows or static aerated piles. This means that the capital costs are relatively low. In-Vessel: In-vessel systems are either fully or partially enclosed, and can handle more material in a smaller space than windrows or static aerated piles. However, they tend to be more costly. These systems provide better control of aeration, temperature and the moisture in the organic materials being composted, all of which result in faster decomposition. If necessary, water can be added to maintain the correct moisture level, and air can be pumped in to provide oxygen and to control the temperature. Although different in-vessel systems are available, they are generally of three basic types: channels or troughs, containers and rotating drums (sometimes called tube digesters). Channels (or Troughs) The composting process takes place in long rectangular troughs or channels. The organic waste materials are mixed so that the clumps are broken up and the material is aerated. Containers Composting takes place in closed containers that are supplied with air. Excess moisture and exhaust air are removed from the containers to maintain ideal conditions for the micro-organisms throughout the process. Rotating Drums (Tube Digesters) Organic waste materials are added to a drum which is continuously rotating. The rotation ensures that the micro-organisms are constantly supplied with the oxygen they need and that all of the organic waste materials are exposed to them. The material remains in the drum for three to five days and is then transferred to windrows for final curing. Anaerobic Digesters: Organic waste materials can also be digested in an oxygen-free, or anaerobic, environment by micro- organisms that do not need oxygen. The length of time required to digest the organic waste material varies according to the individual technology usually between two and twenty days. The process produces humus, methane and carbon dioxide. The methane is captured and converted into energy. Following digestion, the humus is transferred to windrows for final composting. Antimony trioxide is a hardening agent used in the manufacture of PET (polyethylene terephthalate). PET typically contains several hundred mg/kg of Sb*1. Antimony and many of its compounds are toxic. Clinically, antimony poisoning is very similar to arsenic poisoning. In small doses, antimony causes headache, dizziness, and depression*2.